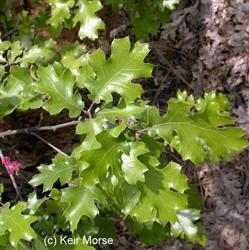 The California Black Oak is a large, majestic oak, growing large angular limbs that produce large multilobed leaves, turning in the ealry fall to create an awesome display. The acorns are the largest of the quercus variety and were a staple source of nutrition for indigineous tribe in winter months. The bark is a dark blackish gray, giving the tree a distinct splash of yellow on black in the fall months.